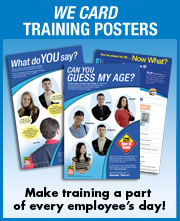 Are Your Training and Store Policies Up-To-Date? According to We Card's Best Practices survey -- which now totals more than 1,000 completed surveys -- one in four retailers don't cover new Federal requirements in their training. That's a big number. Furthermore, the Federal government believes it's important for you to have a written company policy against sales to minors. So does We Card. And we can help. Are Good Managers Made or Born? 3 Tips to Better Managers Good managers are made, not born. Scene from We Card Manager Training Course Have your store managers been trained to effectively manage their employees? The We Card Program examined the learning styles of frontline employees who have taken We Card training. According to the Journal of Engineering Education, learning styles have been described as "relatively stable indicators of how learners perceive, interact with, and respond to the learning environment." Because learning styles can also be described as preferences, you can look at them as a description of how learners would choose to receive instruction if given the option. FDA Enforcement Has Started, What Should You Do? 7 steps to take right now. Before FDA regulations took effect, it was enough to prevent an underage tobacco sale. The thinking was, "is this customer old enough to buy tobacco?" ruled the day. That way of thinking falls short now. Retailers are receiving warning letters from the U.S. Food and Drug Administration (FDA) for selling tobacco to a minor AND for not carding someone who is under 27. That's two violations, not one. Retailers are receiving violation letters Retailers in Mississippi were the first to receive Warning Letters from the U.S. Food and Drug Administration (FDA) after selling tobacco to a minor. Retailers were also cited for failing to check the ID of a tobacco customer under 27 years old. The FDA says it's looking to retailers to help enforce the sweeping tobacco regulations that took effect June 22. "We understand the retailers really are on the front lines and are the key piece to making this a success," said Kathleen Quinn, the acting director of communications for the Center for Tobacco Products at the FDA. "Our approach is they are our partners and we want to equip them with the tools they need." Are Age Calculation Tools a Silver Bullet? Electronic age verification devices take the math out of checking ID. Just swipe the customer's driver's license and the machine does the rest. Sounds simple. We Card calendars take the math out checking ID too. For every day of the month, the calendar provides the birth date required for a legal tobacco sale. In other words, if it's Dec. 19, 2009 and the legal age for buying tobacco is 18, then the customer must have a birth date of Dec. 19, 1991 -- or earlier. Top 4 Reasons For Compliance Failure Just about everyone who works behind the counter in a convenience store or a grocery store knows by now that it's against the law to sell tobacco to minors. So why do retailers still fail compliance checks? Tales From The Trenches Trainers for the We Card program travel the country to train retail employees on how to avoid selling cigarettes to minors. They teach the importance of checking ID's, how to prevent conflict while denying a sale and how to juggle all the tasks of a high-stress job. The stakes are high. In many states an employee can be fined for selling cigarettes to underage customers and the store can lose its license. What's your policy on Third-Party Sales? Imagine you're at the register and a customer, who doesn't look much older than your kid brother, asks for a pack of cigarettes. You check his ID and sure enough he's too young, so you refuse the sale. The teenager heads outside and starts talking to a person in a parked car. Next thing you know, the person is standing in front of you asking for the same brand the teenager just asked for. Again, you do what you've been trained to do. "I'm not allowed to sell you those cigarettes because it appears you're buying for a minor," you say.